* Durable and sleek design- Full titanium loft in drivers and quality alloy in irons painted with sleek and stylish coating will not easily get faded, tore or dented for a long-lasting using and keep an elegant style. * Convenient of Use- each of club numbered for easy recognition and swift switching. Available in 12 angles allow you more selection adjusting to grip and distance, thus to get the most out of every shot in different area. * Ultra-light and flexible- Super light carbon shaft and flexible hitting area specially designed for women with superior control and feel increased the speed within less strength to improve the shot accuracy and forgiveness. * Complete Golf Set- 12 piece clubs with everything needed for golfing including 3 woods for strong and far hitting, 8 irons providing various speed for more distance and 1 easy-to-align pusher for accurate short shot. New to golf? Unsatisfied with current clubs? 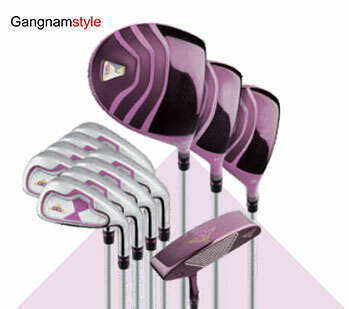 No matter what level of golf you are, this premium Gangnamstyle complete set with all clubs will provides you a brand new and improving golfing life with maximum playability. Gangnamstyle made of high quality materials with ultra-light and flexible shaft for women golfer, combined with its exquisite craftsmanship and advanced technology to give you the best using experience. Gangnamstyle research its wide user data so many years to create this highest performing club set to deliver the most complete performance, and provides maximum spin, distance and trajectory control, so every player can get most out of every drive. Low center of gravity produces higher trajectory shots that travel straightener and longer helping raise initial launch, thus greatly improve your confidence. Oversized hit-area improved workability and forgiving even on off-center hit. A great alternative 8 irons with strengthener alloy sweet zone for various terrains and distance, so you can count on maximum shot-shape selection, allowing hit shots you never have before. Gangnamstyle putter paid unparalleled attention to details including deepening its align line for easier aiming and specially made mallet to evenly share the weight to provide you with extreme accuracy to perform your best.